“Design a building that will help teenagers talk openly and honestly about themselves, their talents and their goals.” That was the challenge Martha Allman, dean of admissions at Wake Forest University, presented Lambert Architecture + Interiors two years ago. On March 22, Wake Forest cut the ribbon on the new 23,000-square-foot Welcome and Admissions Center. “This building is the physical representation of our approach to admissions,” Allman said. View a photo gallery of the new building. 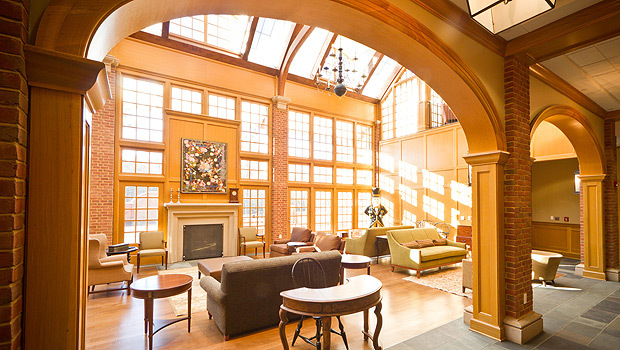 Alcoves and open rooms scattered throughout the building create comfortable spaces for the more than 4,000 on-campus interviews admissions counselors expect to conduct with applicants this year (an additional 5,000 may be interviewed via Skype or a written question and answer session). Since Wake Forest restructured its admissions process and became test-optional in 2008, the personal interview has played a central role in evaluating applicants and changed the way the admissions office operates. The new center is tucked into the woods next door to Starling Hall, which was built in 1956 as the home for Wake Forest’s president and converted to the former admissions office in 1991. Three times larger than Starling Hall, the new building incorporates the warmth and character of the old house, but provides enough space and the new technology needed to accommodate the significant growth in the number of prospective students visiting the office. More than 16,000 prospective students and their families, a total of more than 40,000 visitors, came to the admissions office in 2010. That represents a nearly 50 percent increase in the past five years. High school juniors and their parents who visited the welcome center for an information session earlier this month described the building as “warm,” “comfortable” and “relaxing.” One young woman, sitting in a deep chair by the fireplace in the central entrance area commented, “I was intimidated when I first walked in but I feel better now.” “This would be an excellent place for a wedding reception,” her mother offered, admiring the staircase spiraling to the open balcony above. The new center features public meeting spaces, in addition to staff offices and application processing areas. A 260-seat auditorium will accommodate large groups of prospective students, but will also be available for concerts, lectures and other creative programming sponsored by academic departments and campus organizations. A smaller room for information sessions holds 50 to 60 people. The various spaces allow for flexibility as the numbers of campus visitors ebb and flow during the year. Admissions counselors can also use outdoor seating and meeting spaces for conversations with students. 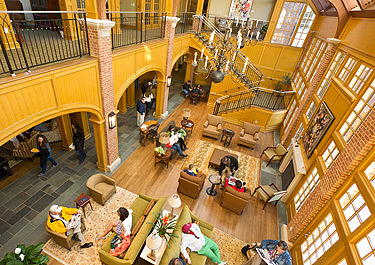 A mix of tradition and innovation, the Old Virginia brick of other campus buildings graces its exterior and the golden tones of oak woodwork warm the inside spaces. A curved skylight using a state-of-the-art insulated fiberglass panel system lights the main level. Two historic chandeliers that originally hung in the Z. Smith Reynolds Library and six chandeliers from Reynolda Hall were repaired, and, in a nod to modern efficiency, adapted to use LED bulbs and compact fluorescent bulbs. On the walls, traditional 19th-century oil paintings complement contemporary art by both Wake Forest students and nationally known artists. Wake Forest expects to achieve LEED (Leadership in Energy and Environmental Design) gold certification for the center. “Everything from the selection of local furniture manufacturers to the use of recycled materials signals to students that Wake Forest is aware of environmental issues,” Allman said. Sustainable design features include high-efficiency mechanical systems, natural light in most spaces to reduce reliance on artificial light, regionally-sourced materials and recycled materials, such as the copper used for the roof. Wake Forest worked with Landmark Builders on the project.